That’s a phrase people in northeastern Ohio will soon see and hear more often in advertisements and promotional materials. After decades of “Rust Belt” hell, manufacturing is enjoying a renaissance here. Many old-line industrial operations have fallen by the wayside while industries like aerospace, materials sciences and health sciences are growing. Industries that apply world-class technologies and techniques are flourishing here. That’s why the state’s regional economic development group, Team NEO, has chosen that phrase as their new tagline. The phrase reflects new economic research showing that, between 2010 and 2015, manufacturing in the region’s 18 counties is expected to far outpace manufacturing growth in the rest of the country. This phrase aptly describes Tusco Display, too. 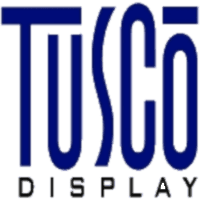 Unlike many display producers who may design and sell but outsource all of their manufacturing, Tusco Display has consistently reinvested in our manufacturing capabilities, even during the tough years of the recent past. That’s why we can say, “We make things here” today, too. With modern production capabilities and skilled associates, northeast Ohio manufacturers are winning business and finding growing success. At Tusco Display, we’re proud to count ourselves among them.